which mean “love” and “peace” respectively. Confusingly, the dot that belongs to the letter baa’ is placed under the meem for what I guess are aesthetic reasons. 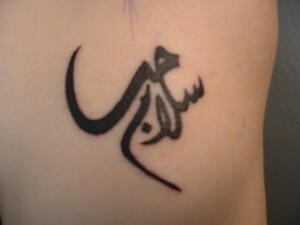 This entry was posted in Calligraphy, Tattoos and tagged arabic tattoo, calligraphy, love, mysterious, peace by ArabicGenie. Bookmark the permalink. 2. I took a deep breath and listened to the old bray of my heart: I am, I am, I am. Until then kind regards from Croatia..
Hi Ivana! Please refer to this page here for custom tattoo designs. how is it written out in ONE line?